Roger Moore, CEO of Nautical Ventures. SB: Tell us about Nautical Ventures and when it was founded. What was the inspiration behind its beginning? 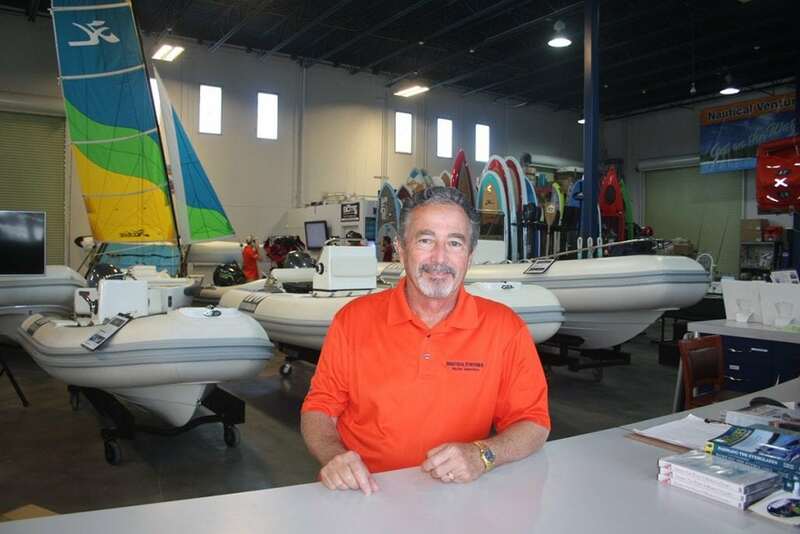 RM: Nautical Ventures was founded 31 years ago as a Hobie Kayak and Sailboat dealer, whose focus was on wholesale and export sales to resorts. In 2010 we purchased Nautical Ventures with the belief that water sports equipment would work synergistically with our brokerage business, QPS Marine, which was providing yacht brokerage, yacht management and yacht refit services. Since the acquisition of Nautical Ventures, sales have grown from $1 million to nearly $5 million in 2014. 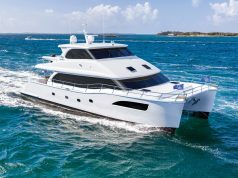 This growth can be attributed to the expansion of our product lines to include Yacht Tenders and a broad offering of yacht-related toys and equipment. SB: How has the company developed and changed since its inception? 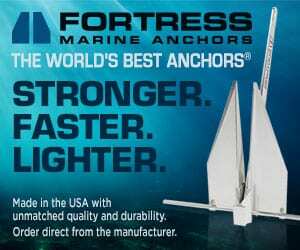 RM: With the increase in the number of products offered we have been able to attract experienced staff that run each “division” of products allowing us to be knowledgeable in each department: kayaks, sailboats, yacht tenders, yacht toys, etc. In 2013 we expanded to include new boat sales via Nautical Ventures Marine, and we are now leading dealers for Century Boats, Buddy Davis Boats, Key Largo, Avalon Pontoon, Caravel, Action Craft, Chapman Transition, Carbon Craft, Novurania, Ribcraft, and Rib Jet. 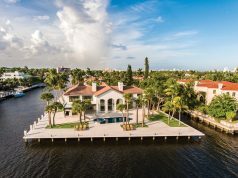 Of paramount note, we built a new 30,000 square-foot state-of-the-art retail and service facility located on the water and designed to provide customers and the marine community, with a pleasurable buying and service experience. SB: What are you most proud of accomplishing and what’s your favorite part of your company and position? RM: Our vision was to have several companies that are all marine related, that work together to refer business to each other, and to be a leader in each category. In yacht tenders we have become the largest distributor and dealer in the country for our flagship line, Novurania. We added LukFuel to our list of companies, which gave us the ability to offer diesel and RAC 90 fuel to the marine and construction communities. 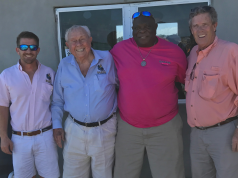 Nautical Ventures Service gave us the ability to service the boats we sell, and the addition of River Bend Marine Center gave us the ability to service larger yachts and perform major refits. SB: How has your company made a difference in the marine industry? Provide examples. RM: With the recent development of our AquaZoneTM we have brought a new dimension to the store and to key boat shows. Our 40,000-gallon mobile aboveground pool allows us to demonstrate interesting fun products and provide excitement to our Demo Days and the Boat Shows with user engagement. Attendees can witness the X-Jet Blades soaring 30 feet above the pool, and watch our Hovercraft transition from land, up a ramp and spinning donuts in the pool. They can also see our gas-powered Jet Surf Board racing and jumping to the delight of all who view it. The AquaZoneTM allows for the hands-on demonstrations of the Hobie Mirage Drive Kayaks, SUP and Yoga Sup lessons, kayak fishing clinics, and much more. SB: Which top three products do you recommend for cruisers and why? RM: Every cruiser needs 1) a reliable tender for both ship-to-shore transport and water sports activities; 2) yacht and land toys to play with at their destination and, 3) a folding electric bike to get around town while visiting ports of call. Our new GoCycle is a great example of a lightweight, collapsible, corrosion proof, powder-coated magnesium electric bike that is fun to ride, fast and gets many hours on a single charge. 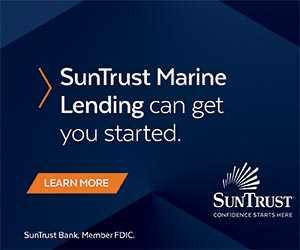 SB: Are you involved in any outside marine organizations? Which ones and why? RM: With growth of nearly 80 percent per year over the past 5 years, there has been little time and manpower to dedicate to become properly involved in any marine organization. We are a main sponsor for the Extreme Kayak Fishing Tournaments. We’ve also formed an association with the Maritime Professional Training Team (MPT) of Fort Lauderdale who provide training to professional mariners on small craft deployment of life-saving crafts from larger vessels. Together with MPT we will also offer on-site training and safety classes, including introductory and intermediate boating courses. I am hopeful to become more active in outside marine organizations as things settle down and specifically the MIASF has been on our radar for some time. SB: Do you currently own a boat? If so, what is the make and model, and how extensively have you cruised? RM: We currently own an 84′ Northern Marine Expedition vessel that has been my pride and joy. Samantha, my wife of 44 years, and I have been living aboard boats for the past 28 years. After selling our business in San Francisco, we decided to buy a boat and take several months off to cruise the California coast. That initial cruise led us to Mexico and then we crossed the Pacific Ocean to the Marquesas. We enjoyed it so much that we continued the journey and ended up traveling 45,000 nm over 13 years, visited some 435 ports around the world, and eventually ended up here in Fort Lauderdale where we permanently dropped anchor. It was here that we met our business partner, Jeff Garcia, who sold the 63′ Cheoy Lee Motor Sailor that was our traveling home for 13 years. SB: What else do you want people to know about you and your company? RM: My joy comes from the growth of the company and the people we have attracted to it. We started with about 15 employees and now have close to 75. Watching them grow personally and professionally to meet the challenges of our rapid growth has been most rewarding. In addition, we have developed a culture of trust and respect for each other as well as with the customers who come here. Yes, we need to sell products, but we want to sell the right product to meet the customers’ needs. There are no hidden fees and no pressure sales tactics. We want to win customers for the long haul and build a repeat customer base that is happy with our service, staff and dedication. When you think of us, we want to be known as the GO-TO PEOPLE FOR FUN ON THE WATER! 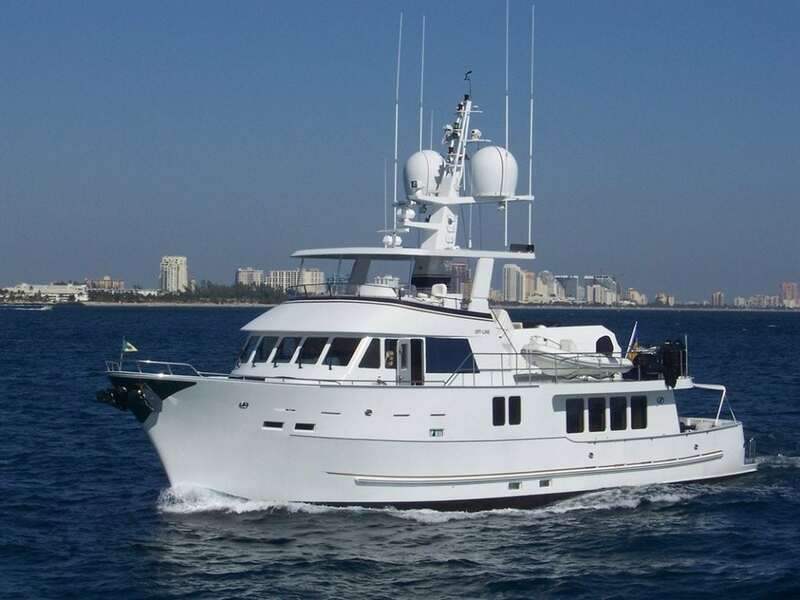 Off-Line is an 84′ Northern Marine Expedition vessel that is the pride and joy of Samantha and Roger Moore.